Pure pretty Cara is a style available in a rainbow of bright rich colors. A subtle and pretty shaded curlicue edging around the photo, a pale color bar accenting the photo, and delicately framed with the same pretty curlicue edging makes Cara a bright and pretty style. 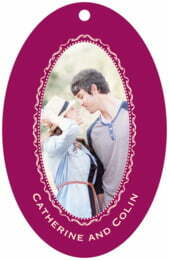 Customize your Cara anniversary tags today! Cara anniversary tags are printed on one side and are blank white on the back. You have the option to add text on the back for a small charge—just ask! Anniversary tags are printed on extra-thick cover weight white paper and come in a variety of shapes and sizes, including the basic square, a scallop-edged circle, ovals, and other shapes. Anniversary tags come pre-punched with a small round hole to thread your choice of tying material. They are punched out individually and packaged as a set in small bags. Select a shape and color from above to start customizing your Cara anniversary tags today!